Rosella Namok has been the most successful of the artists familiarly known as the Lockhart River ‘Art Gang’ whose works appeared on the contemporary art scene in the late 1990’s after funding for education and employment in their remote far north Queensland community. She emerged as a leading figure following regular art excursions and a visiting artist’s program, which included Guy Warren, Garry Shead, Adam Rish and cartoonist Michael Leunig. Her artistic development was further encouraged through printmaking under the guidance of Fran and Geoff Barker. Namok’s style of painting involves stripping back layers of paint that have been built up one above another while still wet. By using a rubber thong or palette knife, these are selectively removed to reveal the shifting colours beneath. In this way serendipitous effects are created as the different layers subtly affect each other and refine inherent opposites. Namok currently lives and works in Cairns. Namok describes herself as a ‘modern artist’. Her painting engages traditional themes but she explores them in her own distinctive style, bearing the markers of a modern sensibility. Her ‘culture and stories’ revolve loosely around several narratives. They are stories of her social and physical or natural environment, featuring events such as hunting and fishing expeditions, weather patterns of rain and wind or the traditional stories of Kaapay and Kuyan. Her abstracted imagery enables her to evoke tensions and disharmonies within the largely closed Lockhart River community through works, which intuitively bridge the figurative/abstract, traditional/modern diametric. Her paintings resolve at the point of experience. They are expressions of a way of life in Lockhart River where ancestral heritage is part of everyday life, and so the traditional finds form in the modern. Namok talks about the value of just ‘yarning’, telling stories, as a way of communicating life experience, evoke Dreaming narratives, or simply relate the events of everyday life. Her technique and the way she works into the paint on the surface of the canvas mirrors the way women draw their fingers through the sand while yarning. 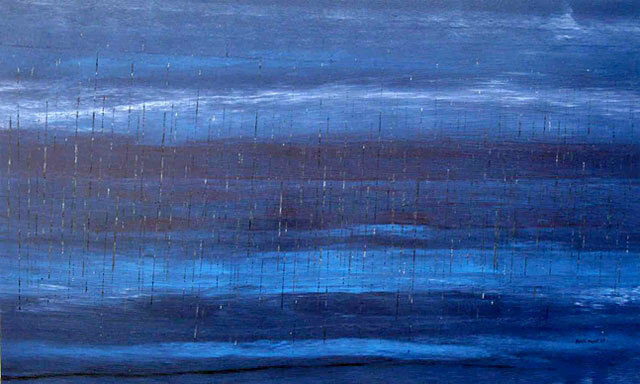 The work above 'Shower Rain...night time...him fall down' was created in 2008 and measures 111 x 180cm. It is a fine example of the most commercially successful strand of her work. In these ‘rain paintings’ shifting scapes of water and land reflect the volatile nature of the tropical weather in her country. During the wet season, sheets of drenching rain and annual floods close the roads for up to five months. The mood and daily life of the community significantly alters. Since her first solo exhibition in 1999 at the Hogarth Galleries in Sydney, Namok has achieved unparalleled prominence for an Indigenous female artist from Far North Queensland. Her attractive personality and talent made her a celebrity figure at just 23 when she was reputedly the highest grossing Australian artist of her age. She rose to sudden artistic prominence at 23 years of age, and is now 29. In 2001 and 2002 she was listed in the Australian Art Collectors 50 most collectable artists and the publicity and hype surrounding her early years has not abated to this day. She is cast, in the contemporary Indigenous art scene, as a celebrity figure and this, along with professional representation and sound mentoring, has seen an exponential rise in the market value of her work. It is extraordinary to think that this young artist has already had more than fourteen solo exhibitions since 1999 at galleries of the quality of Hogarth Galleries in Sydney, Andrew Baker Gallery in Brisbane, and Niagara Gallery in Melbourne as well as October Gallery in London. In addition, her works has been shown in Paris, Washington, Georgia, Berlin, Austria and Slovenia. In 2000 she won the Lin Onus Youth Award at the Fifth National Indigenous Heritage Art Awards and in 2004 the High Court Centenary Art Award. The list of solo shows she has participated in is only just as impressive as the number of important Australian and International collections that have acquired her work. However respected Sydney Morning Herald art critic John McDonald, sounded a note of caution when in 2005 he wrote: 'I suspect that Namok’s work is being bought primarily as an investment, and only secondly by genuine fans. All those small buyers who never secured a Rover [Thomas] or and Emily [Kame Kngwarreye] when they were affordable are determined not to miss out this time around.' There may be some truth in this. Interestingly, at what is still a very early stage in her career, 47 works have already been offered for sale in the secondary market and 28 of these have failed to sell. It is very early days for this artist however, and this is most likely due, as McDonald suspected, to speculative trading in minor works. Her two highest records at auction fit squarely with the prices currently asked by her primary market galleries for equivalent works. Rosella Namok is a very interesting young Indigenous artist and collectors would be wise to keep a cool but discerning eye on her progress over the coming years. Don’t be taken in by all the hype. She is a fine artist and is capable of beautiful enigmatic works that explore both the landscape of her country and the human condition of its inhabitants. She has been positioned in the public eye as an example of a new wave of contemporary/traditional painters but her work defies simple categorisation. Collectors should not be afraid to invest in paintings like this fine example. They will undoubtedly prove their worth both aesthetically and financially in the long term.